Today we visit Meteora (Greek for suspended in the air), one of the largest Orthodox monastic complexes in Greece, built from the fourteenth to sixteenth century on gigantic sandstone pillars towering over the northwestern corner of the Thessaly Plain. Of the original 24 monasteries, only six remain and are still home to small religious communities. 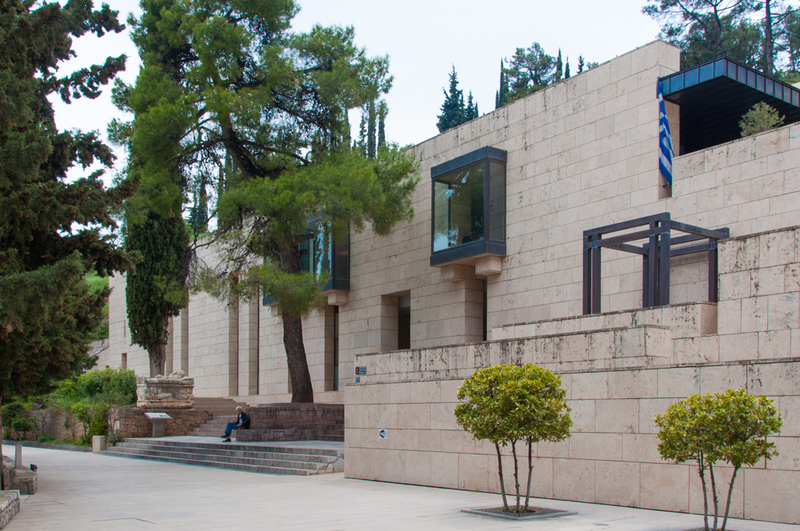 It is one of the most visited historic sites in Greece and we happen to be here during a long holiday weekend. Anticipating crowds, our Tripology Adventures leader Yoav Barashi, has called for an early start and arranged a mid-morning privately-guided tour for us at Great Meteoron (a.k.a. Monastery of the Transfiguration of Christ). Steps hugging the chasm lead to the entrance of the monastery. Perched on Platys Lithos (or Broad Rock) over 400 meters (1,300 feet) above the plain, Great Meteoron is the highest as well as the oldest and largest of the monasteries. It is slow going on the recently built road up to the nearby plateau. From the small parking area, the monastery is reached by a footbridge that straddles the chasm and leads us to the base of the 300 steps cut into the rock face. At Grand Meteoron the pulley system is still used to lift up supplies. I recall a friend who had spent a summer roaming around mainland Greece in the mid-1970’s telling me how she had happened onto “a forest of colossal stone pillars topped with medieval monasteries” at the edge of the Thessaly Plain. It was a well kept secret then, with no visible mean of access other than an oversize basket pulled up and down by a basic rope and pulley system to transport the monks when they went down to the village for supplies. After several days’ wait she was able to make contact with one of them and get a lift up for a visit. That was before James Bond gave Meteora its moment in the limelight by tracking villains to the Holy Trinity monastery for the suspense ending of its 1981 caper “For your eyes only,” and UNESCO anointed the complex a World Heritage Site in 1988. Much has changed since then. A licensed English speaking local guide leads us on a comprehensive tour of Grand Meteoron. 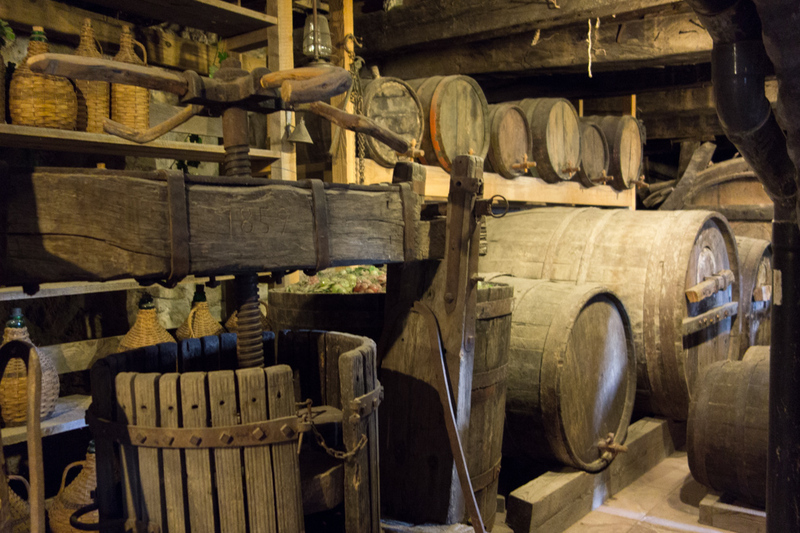 With only three monks remaining in residence, the original kitchen, pantry, wine cellar and the artifacts of everyday life they still hold have become museum exhibits. The original refectory with its elegantly vaulted ceiling now holds the monastery’s rich collection of ancient manuscripts and icons. The ossuary can also be viewed, with its grizzly display of skulls of the earliest residents neatly lined against the back wall. For me the gem of the visit is the katholikon (orthodox equivalent to a conventual church in Western Christianity). The Katholiticon is topped with an elaborate twelve-sided dome. Due to its isolated location, Meteora became an academic and artistic safe heaven during the four centuries of Ottoman occupation of Greece. Hellenic culture and traditions were kept alive here, especially at Great Meteoron. The monastery attracted among its early disciples Saint Iosaph, a Serbian king who became a monk here in 1373 and endowed his fortune to the monastery. The Church of the Transfiguration built in 1388 and the nave and narthex added in 1545 are in the Greek square cross floor plan and topped with a striking twelve sided dome. 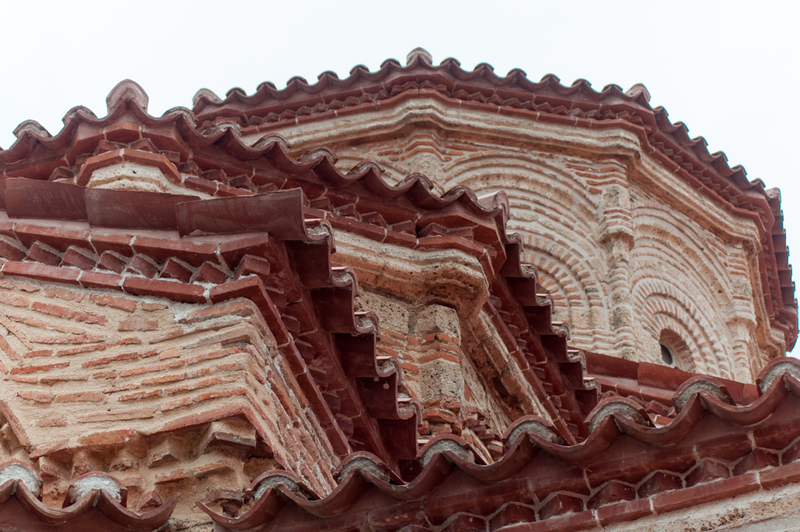 They are a fine example of orthodox architecture and a perfect backdrop for the icons adorning the sanctuary. Ancient frescoes still decorate the passage way to the cloister. 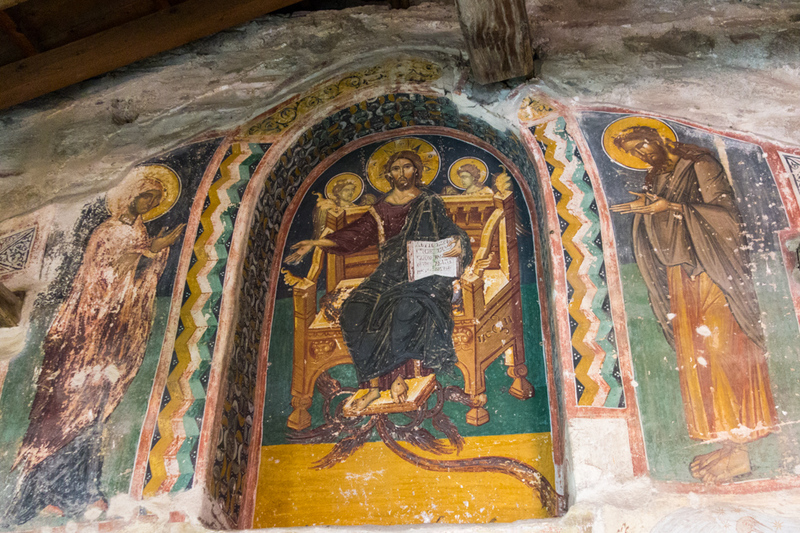 Painted in the late fifteenth century, the frescoes of the katholikon are in the Macedonian style, depicting the Virgin Enthroned and scenes from the life of Christ. I especially note images of Christ Pantocrator that remind me of the early Christian mosaics in Istanbul’s Agia Sophia. The nave and narthex frescoes, painted in 1552 are in the more rigid style of the Cretan school and recount the early gospels as well the gruesome martyrdom of early saints. They also include portraits of the monastery’s founders Athanasios and Ioajph. It is a rare pleasure to come across ancient frescoes that have been so well protected by their isolated environment that they are still in their original state and in remarkable condition. 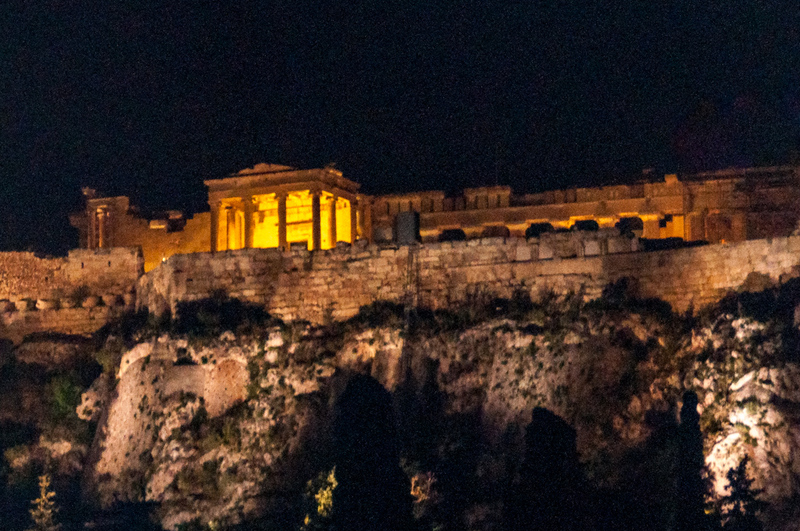 The Acropolis aglow against the night sky. We head back to Athens to next morning. The smooth, multi-lane highway with its slick roadside rest stops and souvenir shops is a bit of a culture shock. After a detour for a long seaside lunch of freshly fished seafood at a small resort on the Gulf of Corinth we get back into our vehicles for the last leg back to the Hotel Alexandros. The mood is subdued. I trust I am not the only one to feel a pang of regret to have arrived at the end my Greek Odyssey. But I am premature in my assumption. Izhar Gamlieli, the Tripology Adventures co-founder who has been in the background all week orchestrating our off-road expedition, has one more treat in store for us. 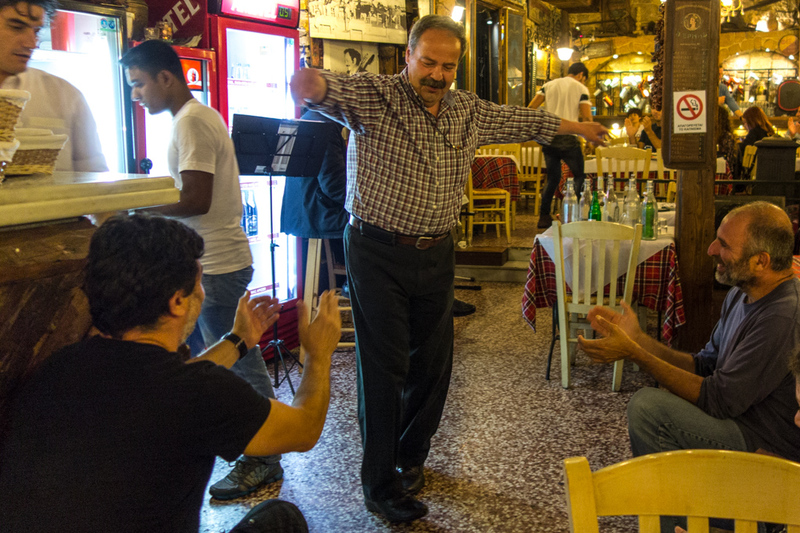 As the starry night falls on Athens we follow our Tripology hosts through the trendy streets of the once gritty Psiri neighborhood to one of its oldest taverns for an epic farewell dinner of the best local specialties, live Rebetika music and laughter. As the evening wears on, Nikos Manolis, our wonderful lead driver (and a national figure in the Greek rally racing community) who has led us though this unforgettable off-road adventure, finally breaks into the Zebekiko dance we have been begging him to do for us for the past week. Move over Zorba! Before long a couple of other patrons come to watch, respectfully waiting for Nikos to acknowledge them with the traditional tap on the foot before taking part in the dance. And then we, a group of reserved strangers a mere eight days ago and now a band of friends, all join in. And the Zebekiko (which traditionally is danced by men only) turns into a would-be Sirtaki kicking line with much joking and laughter. After this unique opportunity to encounter the Greece of the Greek people, I have fallen in love with the country and can’t wait for a return visit. As for off-road touring? This experience was so intoxicating that I feel the Tripology Adventures logo should include a warning label. I am already poring through their itineraries for my next destination. Tripology Adventures is an Israel-based road travel company that has been leading 4WD self-drive caravans across remote, culturally rich regions of Europe, Africa and Asia for over two decades. Tripology Adventures, www.tripologyadventures.com, email:info@tripologyadventures.com, or call 888-975-7080. 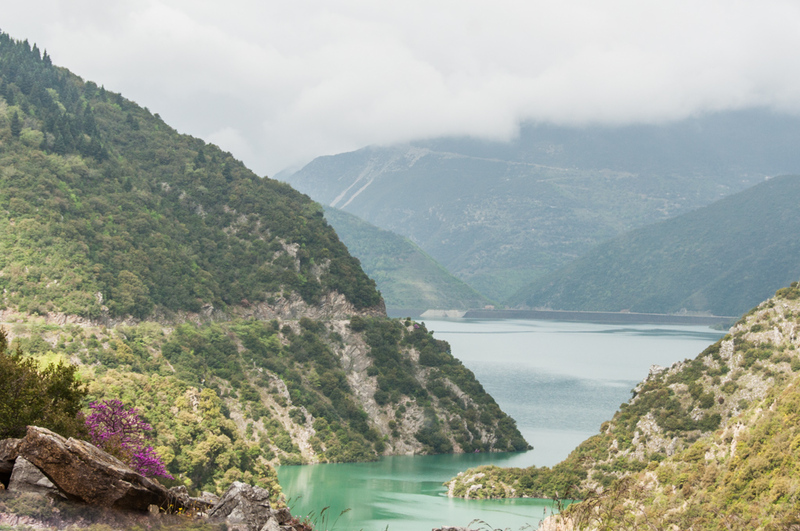 Hard to imagine but the landscape keeps getting more dramatic as we zigzag up and down the dirt roads of the Agrafa, deep in the Evrytania region toward Lake Kremaston, the largest artificial lake in Greece. And I find it easier to enjoy the view now that my car mate Mary Bailey has asked about the tiny roadside shrines standing at the very edge of the most precipitous drops. They are getting more frequent as we go deeper into the wilderness. Since Mary is by now doing all of the driving, I understand her concern. They are kandilakia, and yes, they sometime commemorate fatal accidents, but they are just as likely to give thanks for catastrophes avoided, Yoav Barashi, the leader of our Tripology Adventures caravan, assures us. Or they can simply mark a spot for an instant of private devotion as people go about their daily business. Lake Kremaston and Episkopi Bridge. Under a robin’s egg blue sky, the scenery is a riot of colors. When first revealed from high on a ridge, Lake Kremaston is a palette of greens from pale jade to emerald, turning to teal whenever the sun hides behind a cluster of puffy white clouds. The Judas trees are in full bloom, splashing the mountainside with random hot pink patches. This is a photographer’s paradise and every few minutes someone gets on the radio to announce an impromptu photo stop, until Yoav ends the chaos by telling us the best vantage point is just ahead. Once we are back in our cars, he finds a sure way to keep our unruly lot going. He entertains us with a story. Yoah is an Olympic-class storyteller. Whenever driving conditions allow, he takes to the radio and weaves mythological tales for us (with voices) with such an irreverent humor he has us all asking for more. Who knew that Greek mythology was all about testosterone-laden Zeus, all these demi-gods birthed from his various body parts and his wife Hera’s dim view of his shenanigans! We stop of a break on the sandy shore of the Trikeriotis River. By now we have crossed the Episkopi Bridge to the far size of the lake. We follow the tree-shaded shore of the Trikeriotis River where we reach a sandy beach and find Izhar Gamlieli, co-founder of Tripology Adventures, putting finishing touches to our morning break. The river looks like liquid rock crystal as it rushes toward the lake. We reach of small village high in the Agrafa. It’s a long, steep climb out of this idyllic place. At times the road seems little more than a ledge not much wider than our cars and with lots of sharp turns. I wonder idly what would happen if we were to come face to face with an incoming car? Mercifully, I don’t have to find out. All we see are goats that bounce up the mountain at the sight of us. Eventually the road widens and flattens a bit and we come to a village. Yaov tells us to walk down to the platia while Nikos, our lead driver, takes the cars down. I pause to snap a few shots of the valley below, and almost get knocked of my feet by jet engine thunder. The culprits are already vanishing behind the next ridge before I grasp what just happened. Here I am in a remote village that has been clinging to its mountainside since the days of the Ottoman invasion, and I am getting buzzed by the Greek air force! The footpath down is so precipitous it could have been traced by the goats. Although well kept, the village looks deserted. I don’t see a soul until I reach the platia and find Izhar once again on catering duty setting up a buffet lunch. 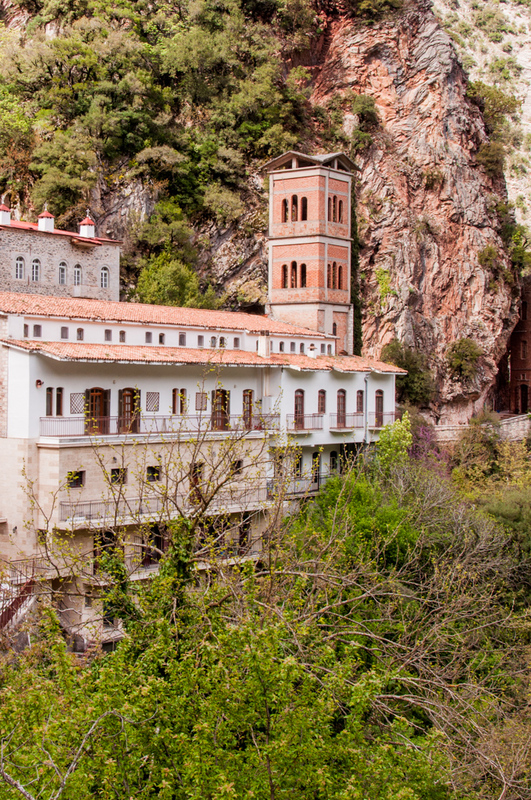 The Proussos Monastery is home to a sacred icon said to have healing powers. 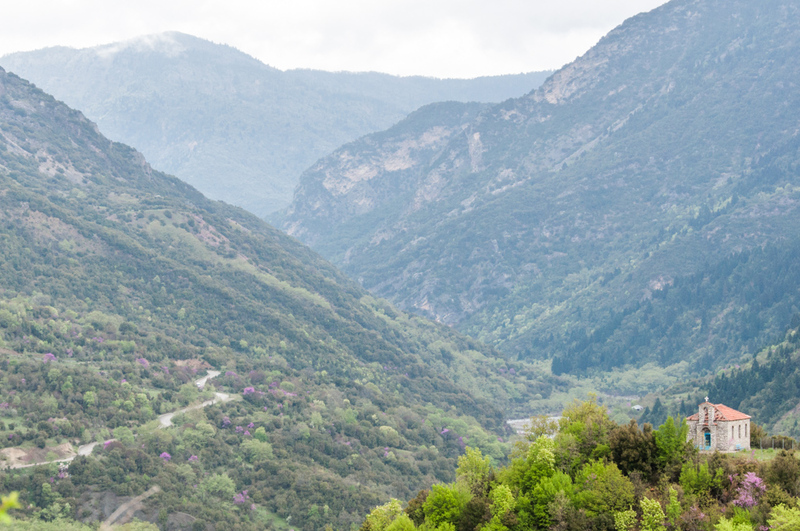 Back on the road, and there actually is a proper road here, albeit narrow and hewed into the rock high above the Karpenisiotis River, we head to the Panaghia Prousiotissa (or Proussos Monastery). 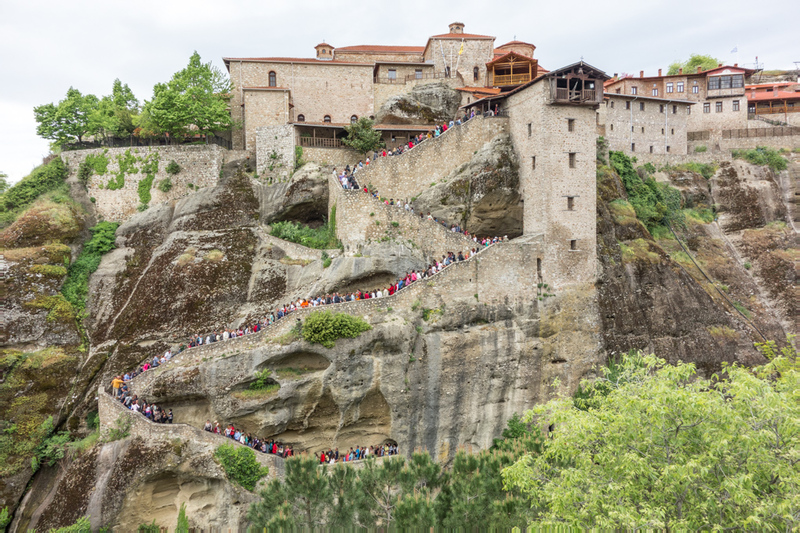 According to tradition this monastery partially overhanging the edge of a chasm traces its roots back to the discovery by local shepherds of a miraculous icon of the Virgin Mary. Originally from Proussa (in Asia Minor) the icon is said to have found its way to a shallow cave here during the reign of the iconoclast Byzantine Emperor Theophilus (829-842 AD). Believed to have healing powers, it has remained to this day in its shelter within the monastery that was built around it starting in the twelfth century. It is a place of pilgrimage for faithful from all over Greece. In addition to the icon, the chapel that surrounds the cave also includes thirteenth and sixteenth century frescoes. With Karpenisi only 30 kilometers (18.5 miles) away, we are back at the Hotel Spa Montana in plenty of time for me to enjoy a water massage in the spa’s elegant glassed-in pool before dinner. Tonight we discover another of Izhar and Yoav’s favorite restaurants in a nearby village. That’s one of the pleasures of traveling with them; they know all the best places and have friends everywhere. This gets us invited to visit the kitchen and witness the unveiling of a delicious lamb and potato stew that has been simmering for hours cocooned in charcoals in an ancient oven. 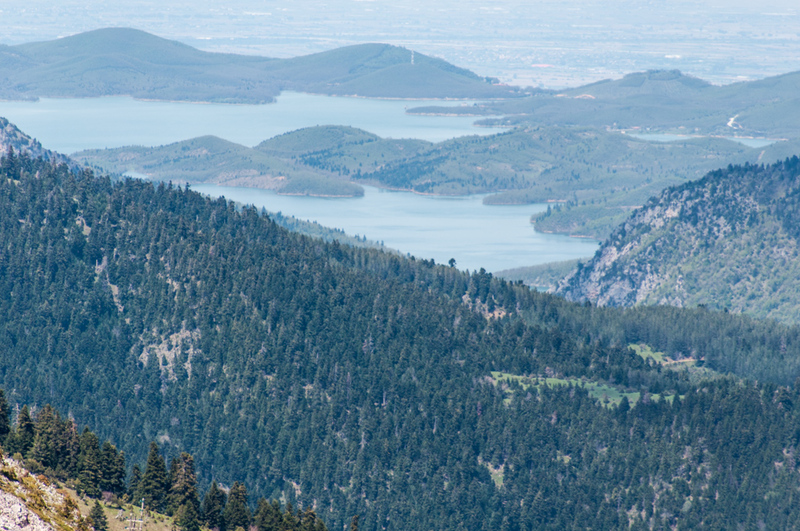 From Niala Peak’s Kamaria Pass the view reaches the vast expanse of Lake Plastiras and the plain of Thessaly. Although I have been happily loosing track of time recently, it’s clear than we are now bound for the end point of our expedition, the medieval monastery complex and UNESCO World Heritage Site of Meteora. But before we reach it, there is still an exciting day ahead. We start with a morning climb from the Karpenisiotis Valley to a mountaintop café for our morning break, followed by a steep drive down into a gorge of the Agrafiotis River where we enjoy a waterside lunch of freshly grilled trout at a local trout farm before the climb to the Niala Peak’s Kamaria Pass. At an altitude of 1,657 meters (5,436 feet) the pass is one of the highest in Greece and well above the tree line. 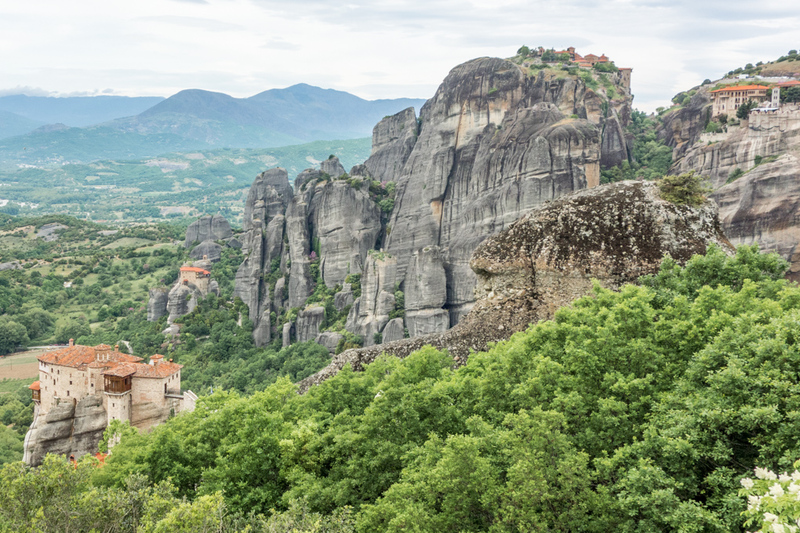 Then it’s down again to the northwestern edge of the plain of Thessaly and our first jaw-dropping sight of the famed monasteries of Meteora atop their colossal sandstone pinnacles. 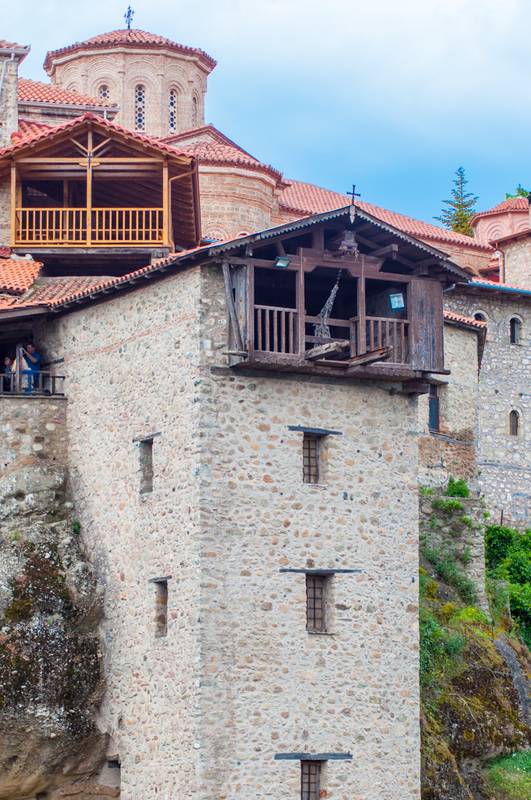 We settle at the four-star Famissi Eden Hotel in Kalambaka where my room has a large balcony with a straight up view of the monasteries. It is the start of the long May-Day Weekend in Greece and when we go for dinner at a lovely Main Street restaurant terrace, the town is lively with tourists, the first we have seen all week. An omen of what awaits us tomorrow when we visit the Meteora complex… to be continued. Tripology Adventures is an Israel-based road travel company that has been leading 4WD self-drive caravan across remote, culturally rich areas of Europe, Africa and Asia for over two decades. Tripology Adventures, www.tripologyadventures.com, email:info@tripologyadventures.com, or call 888-975-7080. It’s Day Two of my Tripology off-road adventure through the mountains of Central Greece. We congregate in the parking lot of the Amelia Hotel in Delphi to carry on our departure routine. Yoav Barashi, the leader of our Tripology Adventures caravan, reviews the day’s itinerary, we eagerly pile our luggage and ourselves with into our designated cars (mine is # 3 and Tim Campbell is at the wheel today) and proceed with an all around radio check. The morning sun is dissipating the last of the early mist as we meander down a country road toward the sea. 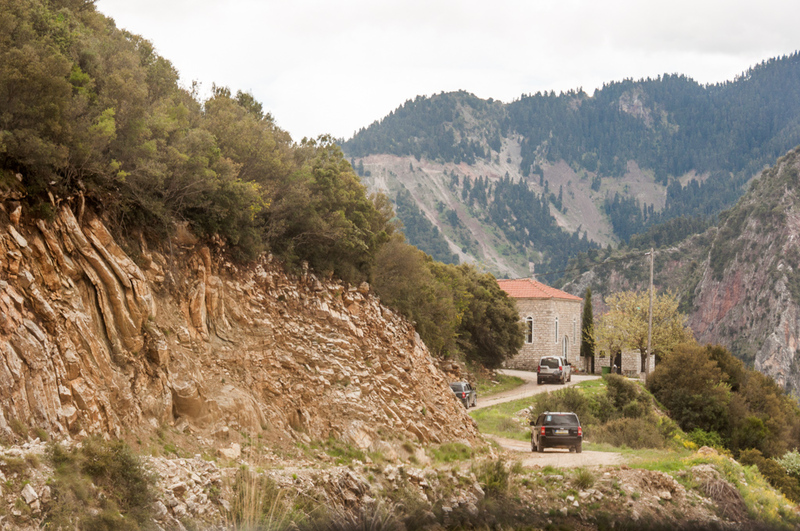 I marvel at the serenity of the bucolic setting, until Nikos Manolis, our lead driver (and a noted figure in the Greek rally racing community) leads us onto a narrow gravel road. This is Bauxite Way, Yoav explains, named for the aluminum ore mine on our right. And by the way, we are now on one of the best-known stages of the famous Acropolis Rally, which is part of the European Rally Championship schedule. The best time recorded on this 24 kilometer (15 mile) uphill, tightly winding trail is 13 minutes (that’s 110 kilometers-or 70 miles- per hour!). Mercifully, Tim takes it considerably slower but we are still stirring impressive clouds of red dust in our wake. Back on paved road high on the Giona Ridge, we catch our first sight of the turquoise waters of the Mormos Reservoir far below. We unanimously call for a photo op stop. 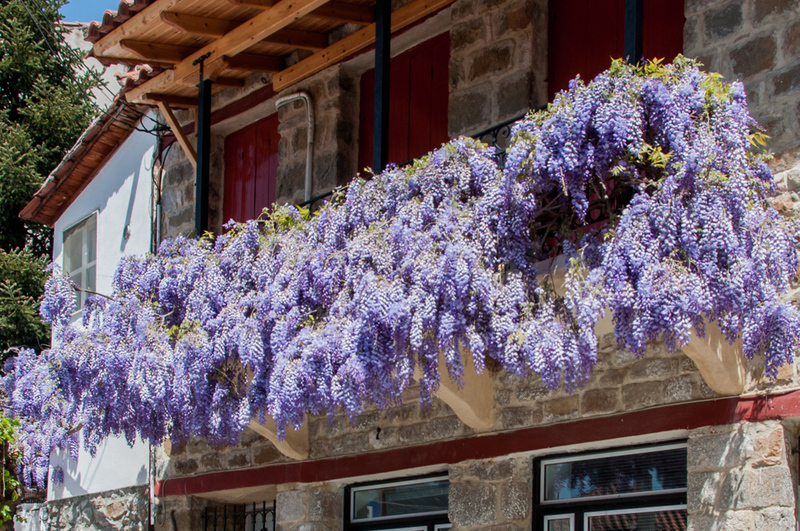 In Lidoriki, main street balconies vanish under a riot of wisteria blooms. The road snakes steeply downhill toward Lidoriki, a postcard perfect little village with just a few shops along a main street not much wider than our Jeep and lined with stone facades overwhelmed by riotous wisteria in full bloom. We stop for refreshments on the platia, the village square that is the heart of every Greek village before resuming our roller-coaster ride, uphill once more. The narrow rocky trail hugs the rock face to the right. The scenery goes from breathtaking to hair-raising as I consider the precipitous drop to our left and the conspicuous absence of guardrail. 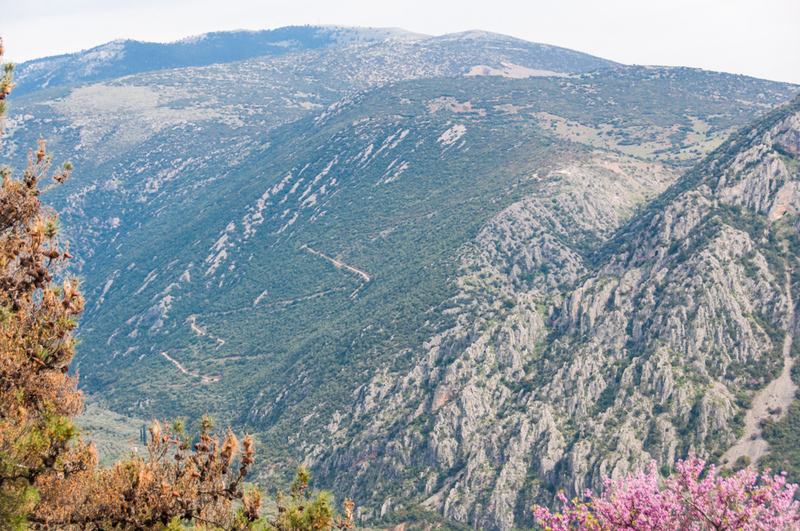 This is the wild, off-the-beaten-paths Greece I wanted to experience, but right now I wish for something a bit tamer. Jessica telling the boulder who’s boss. Picnic view at the top of the ridge. A jarring rock-against-metal grinding sound interrupts my musings as our car comes to a decisive stop. The lead vehicle and Cars # 1 and 2 are already out of sight, Car # 4 has not yet caught up. I reach for the radio (as the non-driver in our car, I am the designated radio operator) searching for the appropriate words to admit that we have just bonded with a boulder. Deep breath. “Number Three to Lead. Do you read me?”. “Go-ahead,” Yaov prompts. “We have … hit a rock,” I squeak. Jessica, the unflappable Coloradoan in Car # 4 takes over with a businesslike “Getting out to assess and will report.” Within minutes Nikos’ big Land Rover comes to nose to nose halt with our Jeep (How did he manage to turn around and go past two cars so quickly?). 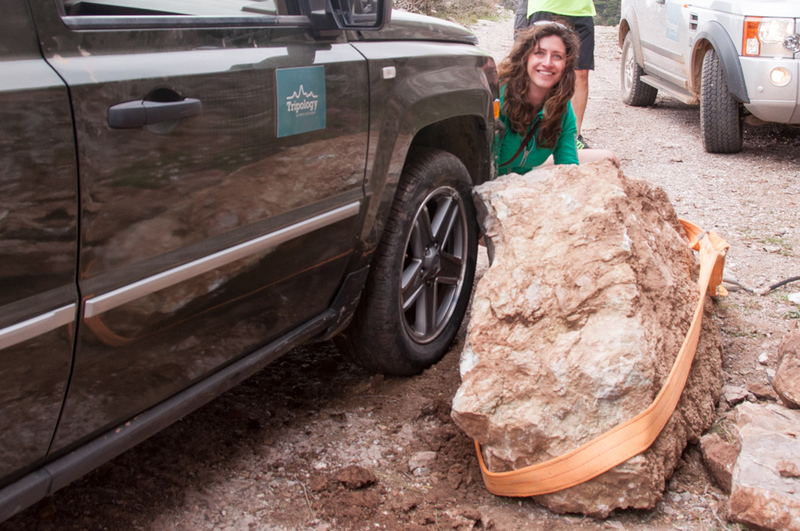 The rock in question is firmly embedded into our front right wheel-well. Nikos and Yaov spring into action. A winch materializes from the front bumper of the land cruiser, the rock is lassoed with the capable assistance of Jessica and just as it is being dragged out of the way a nimble rally emergency vehicle zips to a stop behind us to offer a hand. Tending hives under the Judas Trees. We are off again in short order. When we reach the top of the ridge, we are greeted by Izhar, co-founder of Tripology Adventures, a copious picnic already laid-out and jaw-dropping mountain vistas to the horizon. An hour later, the camping stoves, plastic stools and assorted remains of our picnic stowed into his 4WD, Izhar zooms down the trail with a “see you tonight” wave. We start our descent at a much more sedate pace. Other than lots of goats, the occasional herd of shaggy sheep and now a pair of beekeepers tending to their hives in a roadside orchard, we have barely come across anyone on these remote roads. 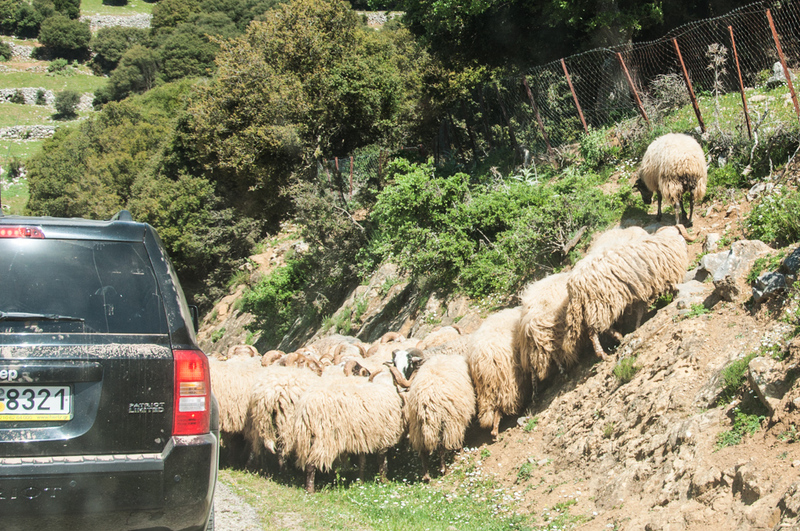 On these mountain roads, sheep have the right of way. But by now I’ve realized that we are never left to our own devices. In addition to our leaders Yoav and Nikos, Izhar is always one step ahead of us, test driving our itinerary to make sure it is still passable (between weather and rock slides, conditions can change fast in these mountains), catering the occasional al fresco meal and checking that hotels and restaurants are ready for us. And there is road support at our back, ready to intervene in case of mishap. How else could the blue mosquito with its crew of two and the spare wheel strapped to its roof have found us so quickly? We didn’t need them this time, but it’s good to know they are here. We dine and stay at the Elatou that night, a cozy country hotel in the mountain village Ano Chora surrounded by dense forests of fir and chestnut trees. 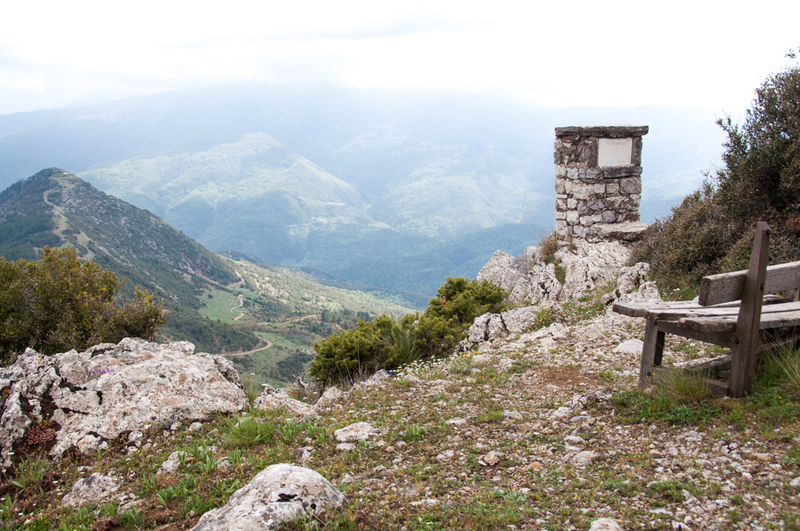 These remote mountains kept the Moors invasion at bay for four centuries. The weather is drab and chilly as we leave Ano Chora the next morning, and even more so when we stop for coffee in Arachova, a village precariously perched on a mountainside. We are in the Evrytania now, a pristine region of steep, thickly forested slopes and rushing streams that have earned it a reputation for splendid scenery and the moniker of “the Switzerland of Greece”. But for now, clouds are blotting out the landscape and the going is slow. Yoav seizes the moment to tell us of the harsh history of the area and the fiercely independent people who left the cities to take refuge in these mountains; and succeeded in maintaining their autonomy and culture through the 400 year Ottoman occupation of Greece. Lake Evinos fills a series of deep canyons. 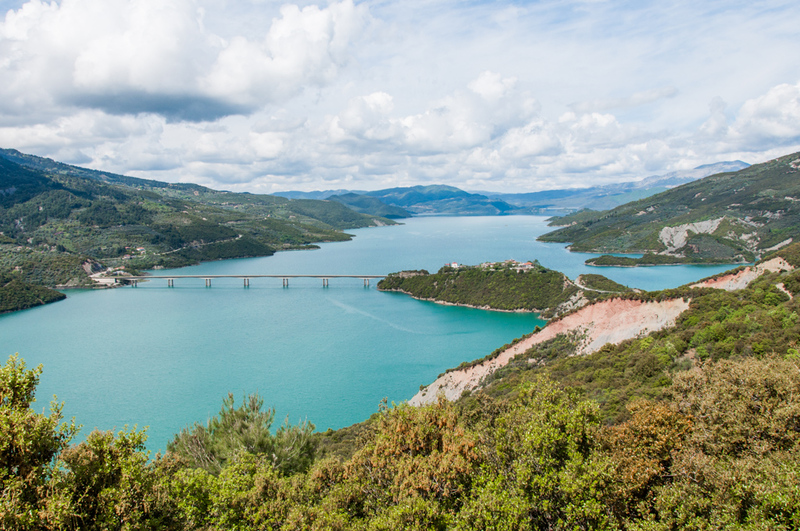 The clouds finally part and we are treated to a bird’s-eye view of the brilliant green waters of Lake Evinos meandering at the bottom of deep canyons, and hills dotted with the bright fuchsia Judas trees in bloom. Our next stop is Krikelo, where after lunch at the cheerful Tavern Antigoni, there is time for walk across the platia to the village church. Behind its humble exterior of pale local stone, it is a treasure trove of gilded byzantine-style icons and dripping crystal chandeliers. 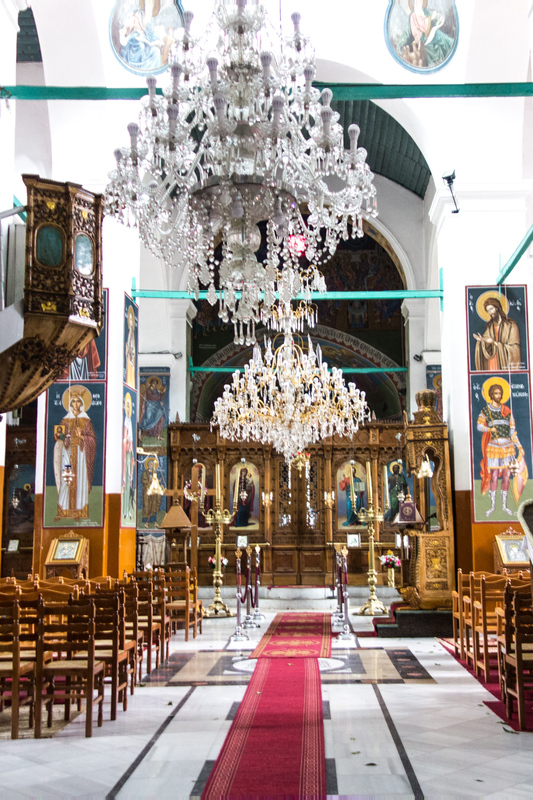 Crystal chandeliers and rich icons light up the village church. One more stop in Megalo Horio, a exceptionally picturesque village clinging so closely to the mountain that it appears to rise in layers from the platia, before heading for Karpenisi, a small town (population 13,000) best known for its popular ski resort. After two days spent exploring remote wilderness, there is something a bit incongruous to being greeted with welcome drinks at check-in and bellman service at the five-star Montana Hotel and Spa. But one look at my room with its king-size canopy bed and spacious seating area opening onto a large deck with a panoramic view of the mountains (plus an oversized whirlpool bath in my bathroom) and I am quite happy to re-enter the lap of twenty first century luxury. We have dinner in a tiny nearby village in a family-run restaurant where Izhar and Yoav are greeted like longtime friends. I never caught the name of the place, but I will long remember the warmth of the welcome and the freshly caught brook trout grilled to perfection. We find our vehicles freshly washed and lined in formation when we leave the restaurant. It reminds me that we haven’t once had to stop to refuel since we left Athens. Tripology fairies must be servicing the cars while we eat or sleep. All this seamless planning and attention to details make our expedition feel so easy I would travel anywhere with these guys. Blame it on Homer, my impression that Greece was all about the sea. Even before I ever set foot in the country I knew of its myriad islands and endless coastline. Accordingly, the Greece of my prior visits had mainly consisted of sun baked islands rising from aquamarine waters, warm sand beaches and gleaming white cubist villages punctuated by indigo domes. 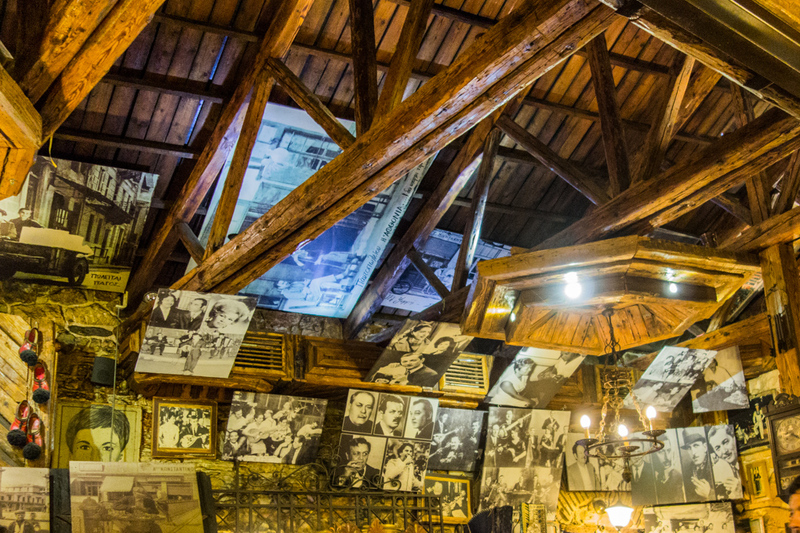 Add a plethora of archeological treasures in various stages of restoration, bountiful dinners of taverna fare and soulful rebetika music. I felt I had Greece covered. 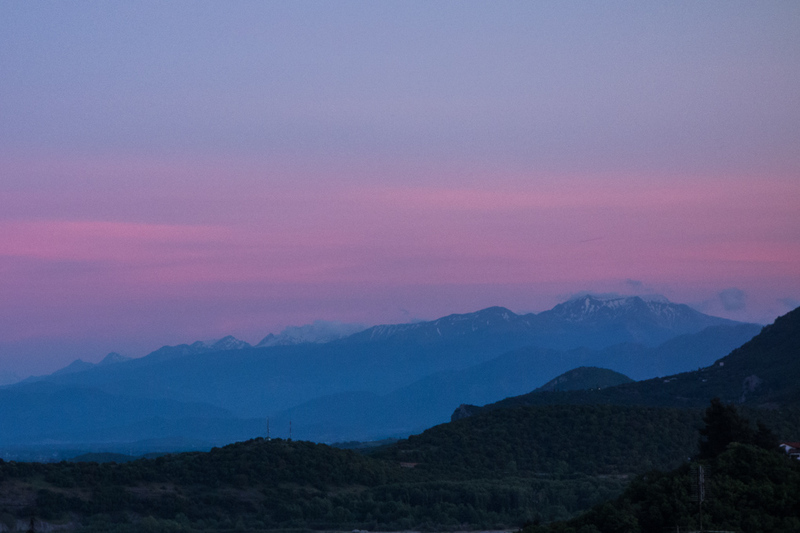 We are headed into the Pindus Mountains, the spine of the Greek mainland. Our itinerary wends up and down steep slopes on roads that are little more than dirt trails. That was before I came across Tripology Adventures, an off-road travel company that has been leading self-drive caravans of four-wheel drive vehicles through Central Greece and other remote, history-rich areas of the planet for over two decades. 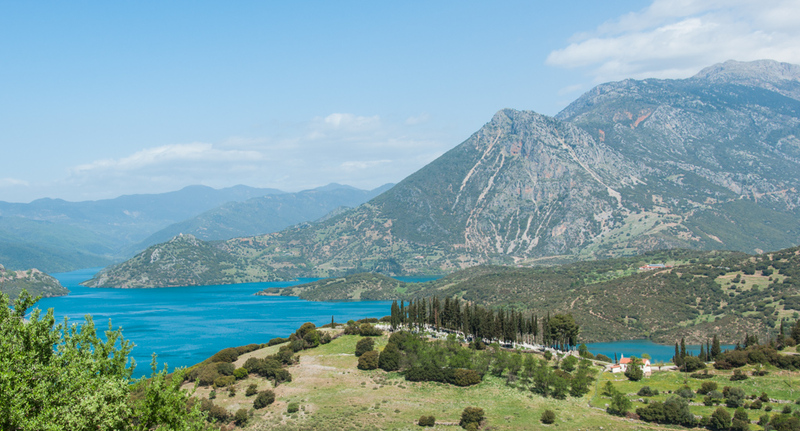 The eight-day itinerary went from Athens to the Pindus Mountains, the southeast to northwest labyrinth of high ridges and deep valleys that forms the spine of the Greek mainland. The impenetrable forests of its central region, the Agrafa (Greek for unchartered), allowed it to maintain its autonomy throughout the four centuries of Ottoman occupation. During World War II it became a center of resistance against Italian and then German invaders. This wild, sparsely inhabited region remains relatively unspoiled to this day. And the roads that wind their way up and down its steep slopes are still little more than dirt trails. This, combined with the self-drive bit causes me to pause. I am a highway driver, an erstwhile soccer mom. Although no stranger to off-road adventure travel, from the African bush to the Himalaya, I have always left the driving to local experts. But an opportunity to discover this other Greece I hadn’t known to still exists is hard to pass. Fortunately Tripology assures me that, while the driving on their itineraries is challenging, many participants actually want to drive. They’ll get no argument from me! There remains one last nagging doubt before I reach for my passport. We are talking group travel, my least favorite way to go. But this trip is so far off the beaten tracks that I could never undertake it on my own. Count me in! 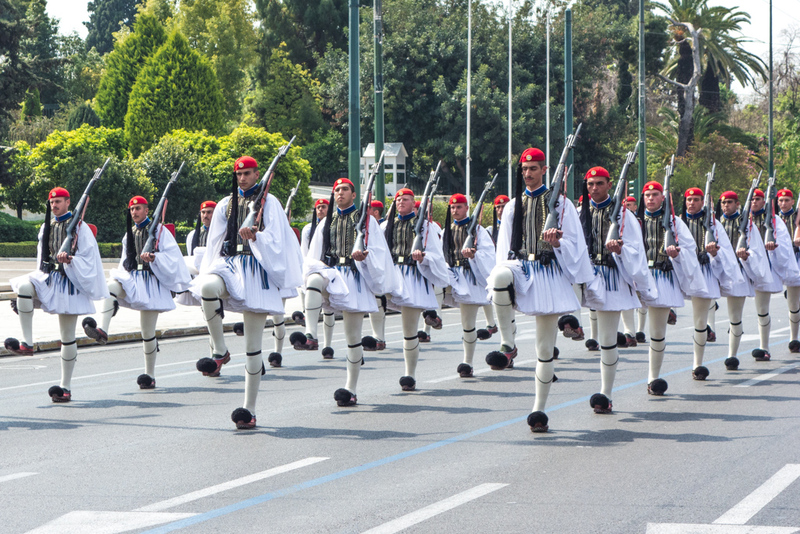 Evzone Honor Guard march to Parliament building on Syntagma Square for the ceremonial changing of the guard. 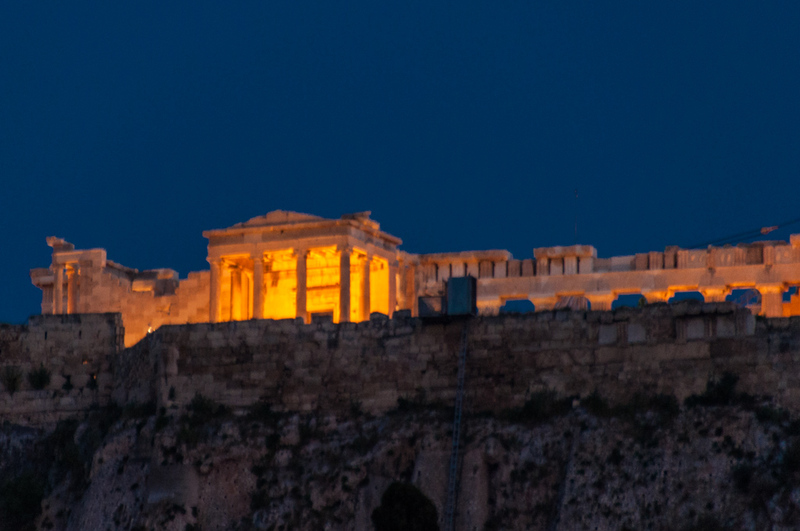 The Acropolis glows against the Athens night sky. We meet at our Athens hotel, the Alexandros, on the afternoon prior to our departure, fourteen of us ranging in age from thirty-something to twice that, three couples, the rest of us solo. After a short get-acquainted briefing led by Izhar Gamlieli, co-founder of Tripology, he shepherds us into the metro for an evening on the town. It’s just a couple of stops to Syntagma Square (Constitution Square), the modern heart of the city. We catch the ceremonial changing of the Evzones, the white-skirted honor guard in front of the Parliament building. Then, after a leisurely walk through the vibrant center of town and past the entrance of the ancient Agora, we settle at the terrace of Diodos, a popular Lower Adrianou Street taverna. Our reserved family-style tables are immediately piled high with the entire gamut of traditional dishes, salad topped with slabs of sweet fresh feta, hummus, melitzanosalata (eggplant dip), tzatziki (cucumber with yogurt and dill), calamari, tiropita (cheese pie), spanakopita (spinach pie). It’s all just freshly prepared and delicious. But it’s only the beginning. Next come platters of grilled chicken, sausage and lamb chops. Our group is starting to connect. It’s impossible to remain strangers for long while tucking into succulent Greek mezedes washed down with hearty local wine, with the Acropolis glowing against the night sky in the background. The level of camaraderie goes up another notch the next morning as we pile our luggage into our assigned vehicle, one of four shiny late model Jeep Patriots lined up in the hotel’s driveway behind the lead car, a massive land cruiser. I meet my Car # 3 traveling companions: Mary Bailey, a cookbook author, editor of The Tomato Food and Drink and all around foodie from Edmonton, Canada, and Tim Campbell, a travel writer from the U.K.
Lead car, do you read me? 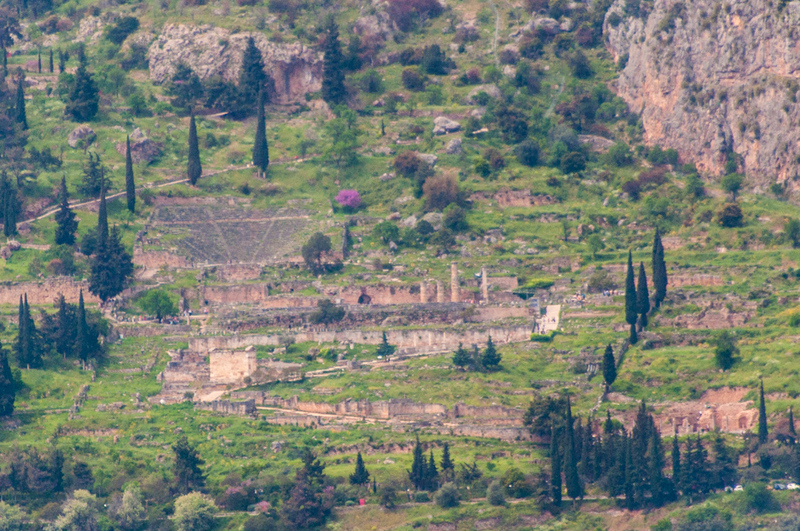 Delphi’s Temple of Apollo overlooks the valley of Phocis. Our cars have two-way radios with a frequency dedicated for our convoy. Yoav Barashi, our tour leader and a passionate grecophile who has been guiding here for a decade and our lead driver Niko Manolis (who turns out to be a national champion rally racer) give us a brief primer on the use of the radio and the protocol for convoy travel and we are off. The instructions are simple enough: follow the car ahead, keep your assigned place in the convoy and above all follow the directions Yoav is giving over the radio. Also, when you make a turn wait until the car behind you starts its turn before continuing on. That one is a real challenge with traffic lights, determined drivers and motorcyclists buzzing all around us. But somehow we all fall into formation again at the tollgate to Highway #1. We can relax now and congratulate Mary for seeing us this far. Nothing could have us bond faster than a narrow escape from the Athens morning commuter traffic. The museum at the archeological site of Delphi. 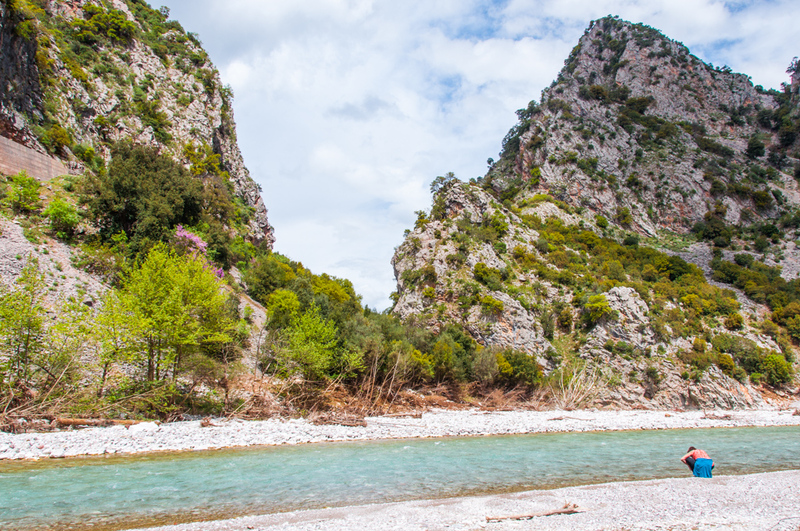 The hills are getting more rugged, especially once we turn onto a country road toward our midday destination, a lovely seaside restaurant tucked in a secluded cove of the Gulf of Corinth. After another Greek specialties extravaganza we continue on to the archeological site of Delphi. Perched high on the southwestern spur of Mount Parnassus, it was decreed the Navel of the Earth by Zeus himself. Yaov has begun sharing tidbits of mythological lore over the radio during the quieter moments of the drive with such an irresistible blend of wit and erudition that we will soon be begging for more at every opportunity. But for now, we are getting our first taste of off-road driving, on a rough trail that is getting rockier and narrower as we zigzag toward the top of the ridge. There is a modern paved road of course, for the busloads of visitors to the site. But not for us the road more traveled, that would deprive us of the ever-changing panorama of hills fading into of the distant sea and our first glance at Delphi and the temple of Apollo from a unique vantage point high across the valley. Guide Penny Kolomvotsou eplains the overall site. 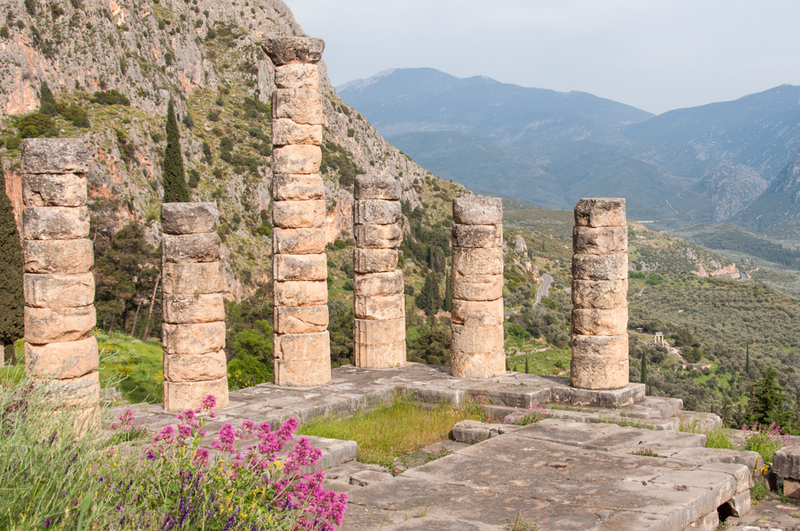 Dedicated during classical time to the god Apollo, an overachieving multi-tasker variously recognized as the god of truth and prophecy, healing, plague, music, poetry and more, Delphi was a seat of the Pythia. This priestess was believed to channel the pronouncements of the Oracle (itself the intermediary to Apollo) that would then be interpreted by the priests.